Did you see our Instagram teaser of today's recipe? 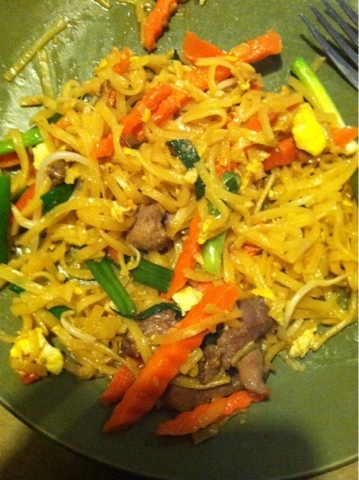 We LOVE Pad Thai, and find this receipe from thaifood.about.com to be simple, quick, and easy. There are variations on the sauce that eliminates both the tamarind AND the fish sauce, but this is how we make it in our house (with both). You can find both at a local asian food market. Bring a large pot of pot to a boil and dunk in your rice noodles. Turn down the heat to low and keep an eye on them: you will be frying the noodles later, so you don't want to over-soften them now. Noodles are ready to be drained when they are soft enough to be eaten, but still firm and a little "crunchy". Drain and rinse with cold water to prevent sticking. Set aside. Make pad Thai sauce by combining the sauce ingredients together in a cup. Stir well to dissolve tamarind and brown sugar, and set aside. Note: this may seem like a lot of sugar, but you need it to balance out the sourness of the tamarind - this balance is what makes Pad Thai taste so amazing! Place chicken slices in a small bowl. Stir together the marinade and pour over chicken. Stir well and set aside. Add the noodles, and pour the Pad Thai sauce over. Using two utensils, use a gentle "lift and turn" method to fry noodles (like tossing a salad). Stir-fry in this way 1-2 minutes. If you find your wok/frying pan too dry, push noodles aside and add a little more oil to the bottom of the pan. Add the bean sprouts and and continue frying 1 more minute, or until noodles are cooked.Noodles are done to perfection when they are no longer "hard" or crunchy, but chewy-sticky wonderful! Taste-test for seasoning, adding more fish sauce until desired flavor is reached (I usually add 1 more Tbsp. fish sauce). Toss well to incorporate. Lift noodles onto a serving plate. Top with generous amounts of fresh coriander, spring onion, and crushed/chopped nuts. Add fresh lime wedges to squeeze over each portion, and if desired, serve with Nam Prik Pao Chili Sauce (homemade recipe) on the side. Here is our result! We actually added beef this time rather than chicken, and it turned our delicious! This looks good! I don't think I've ever had Thai food before...may have to try this though! I love Thai food!! Looks delicious! !